OK, it’s actually a jersey. I have a few other Royals t-shirts, too, ones of Mark Teahen, David DeJesus and Jeremy Affeldt that I got for free back during the “T-Shirt Tuesday” giveaways of 2006 and 2007. This jersey, however, didn’t come for free. I received it as a birthday gift in 2003. My parents got it personalized on Eastbay for me so I could walk around displaying my love of the Royals through my favorite player at the time: (gulp) Angel Berroa. 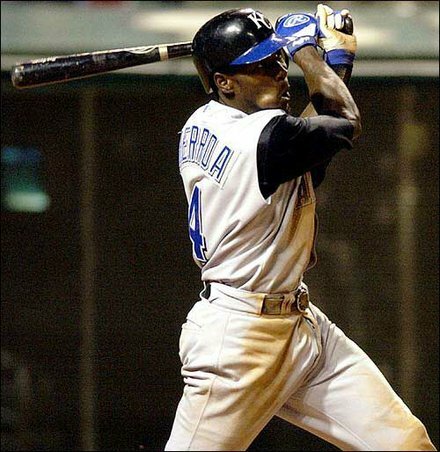 Berroa came to Kansas City from Oakland as part of the trade for Johnny Damon. He made his full-season debut for the Royals in 2003, and people expected great things, considering what the Royals gave up to get him. And in that first season he was pretty good. He hit .287 and had enough home runs (17) and RBIs (73) to make everyone forget he struck out 100 times and swung away more often than Joaquin Phoenix in “Signs.” Berroa also kept in his right cheek a piece of chaw so large you wondered if he would need emergency jaw surgery by the end of the year. The Royals somehow won their first nine games and 16 of their first 19. A massive slump ensued before they brought it all back together before the All Star Break and led the division by seven games. They had timely hitting from Mike Sweeney and Carlos Beltran, quality starts from Runelvys Hernandez, a lockdown closer in Mike MacDougal and they had Berroa. He ended up winning Rookie of the Year. That summer felt magical. We were in high school, able to drive for the first summer, able to achieve independence of some sort. * Many of those days and nights, we went to Kauffman Stadium. The Royals were winning, and they offered a dozen Krispy Kreme doughnuts if the Royals managed to get 12 or more hits. It happened a couple of times for us, and we’d go right after the game, pulling into the Krispy Kreme on Metcalf Ave. and devouring several fresh glazed donuts. *I did, however, work at Target this summer, so it wasn’t like I spent my summer nights pulling all-nighters like in “Dazed and Confused,” unless those all-nighters involved wearing a red polo and khakis and reorganizing the shelves for our valued guests – DON’T EVER CALL THEM CUSTOMERS. The Royals blew their seven game lead and didn’t make the playoffs. But they won 83 games. That was something. And before advanced statistics became the norm, we could delude ourselves into thinking the Royals had actually been a decent and not just lucky team and could therefore win the division the next season. That next season, 2004, I attended the season opener. 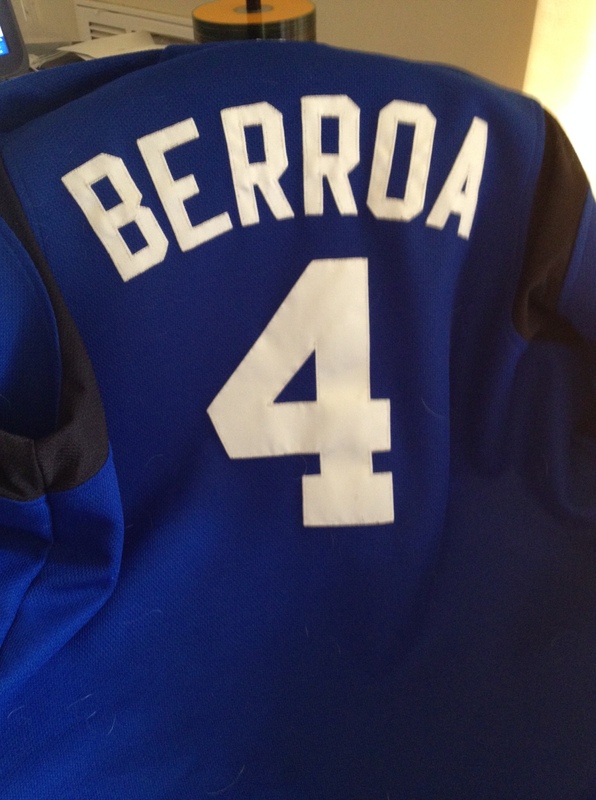 I wore my Berroa jersey. Carlos Beltran hit a walk-off home run. The magic was still there. Then the Royals proceeded to lose 104 games and 106 the next year. Berroa’s productivity plummeted. By 2006, he was hitting .234 with half as many walks as he had in 2003 and playing awful defense at shortstop. He had become the consensus “worst everyday player” in all of baseball. These last few days that I’ve been reading about Kansas City I’ve just been reminded over and over again about how many terrible baseball players suited up for Kansas City who we deluded ourselves into thinking could be good. We really thought Ryan Shealy or Kit Pellow or Kila Ka’aihue or Aaron Guiel might make it. I’ve also thought about my foremost memories of the Royals. Us Royals fans lived a tortured sports existence reminiscent of the one authored by Nick Hornsby in “Fever Pitch.” I remember seeing Felix Jose, my favorite player when I was very young, hit a ground rule double and thought it was the coolest thing ever. I remember seeing the Royals during an eight-game winning streak in 1994 and then lamenting how the season ended with them on a roll because of the strike. I remember sitting in the first few rows as Ken Harvey blasted a walk-off home run in 2003 in the pouring rain. They’re cool, fond memories in a vacuum but added up they amount to exhaustion because the pieces would never fit together for literally my entire life. Yet as I’ve moved away from Kansas since my college days, the Royals have remained my favorite team, the lone local team I closely follow. I stopped paying attention to the Kansas City Chiefs’ record years ago and since graduation I bet I’ve seen fewer than 15 or 20 of the more than 100 basketball games KU has played. I’m pretty sure the pain has kept me close to the Royals (either that or the comedy). This is simply a hunch and not researched in the least, but for a young generation of Royals fans used to nonstop disappointment, I wonder if the Royals made us work harder. I love the essay Brewhouse co-founder Rustin Dodd wrote in the Kansas City Star today. He captured the lives of so many of us and the places we’ve gone and the work that we have accomplished and how we still cling to the Royals and the way we had to celebrate their little victories as we grew up because we couldn’t celebrate anything else. Now we have last Friday night and all the champagne bottles that went with it and hopefully even more new memories tonight and in future seasons. I can’t wait. The only time we’ll ever have to think about Berroa is when I – the only person with an Angel Berroa jersey in the Western world – wears it around a city far, far from Kansas City while people wonder who the hell this Berroa person could be. If anyone asks me today or tonight, I’ll tell them he was going to be the next Jeter as they shake their heads. And I’ll tell them tonight wouldn’t feel quite the same if Berroa hadn’t plagued us for a few seasons. And I’ll tell them I wouldn’t trade this jersey for anything.